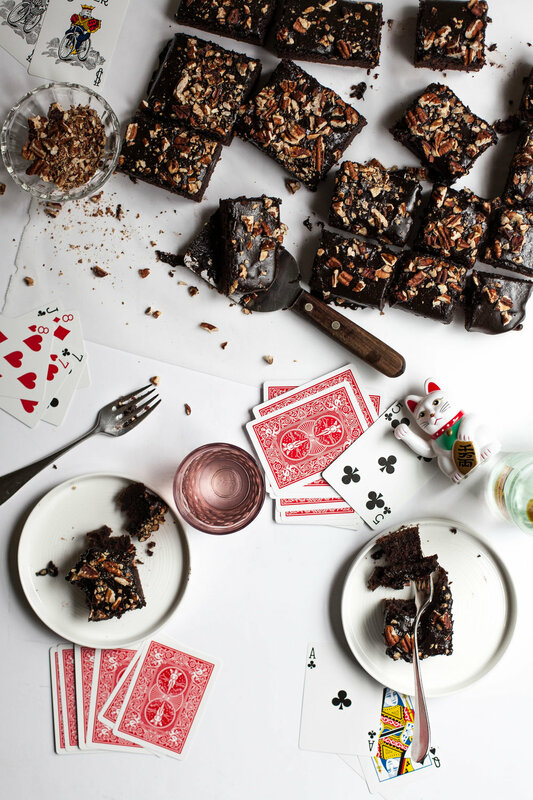 Texas Sheet Cake — always with butter. Oven 375 degrees F. Lightly butter a 9-by-13-inch cake pan. Line with parchment, leaving a 2-inch overhang on long sides. In a large bowl, whisk together flour, sugar, baking soda and salt. Melt butter in a saucepan over medium-low. Whisk in cocoa, then 1 cup water. Increase heat to medium-high and bring to a boil, whisking occasionally. Pour over flour mixture and stir to combine. Stir in eggs, buttermilk, and vanilla. Pour batter into prepared pan; smooth top with an offset spatula. Bake until a tester inserted in center comes out clean, 22 to 24 minutes. In a small saucepan, bring butter, cocoa, and cream to a boil, stirring occasionally. Remove from heat; whisk in vanilla and confectioners' sugar. Let stand until warm before using. Transfer cake in pan to a wire rack; let cool 15 minutes. Pour glaze over cake. Sprinkle with pecans and let cool before serving.